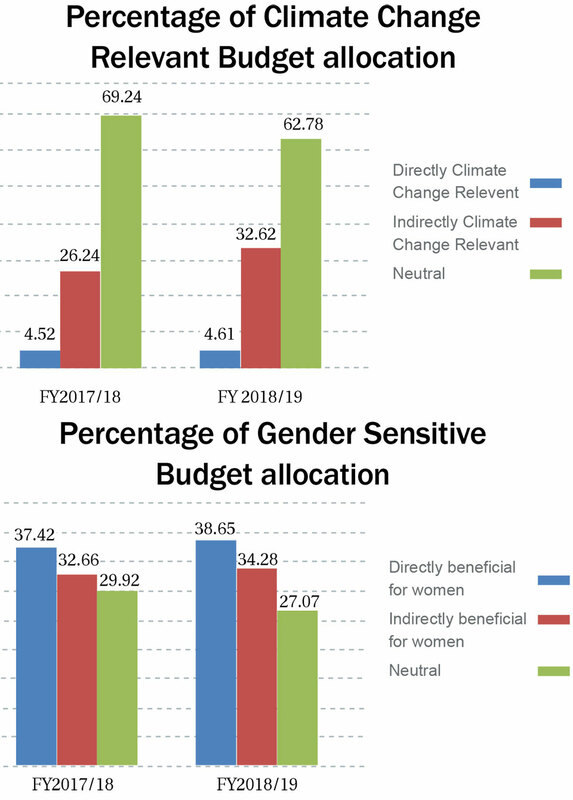 KATHMANDU, June 3: The budget allocations relevant for climate change adaptation and gender sensitivity, as segregated in the federal budget, will reach a new high in the next fiscal year. The budget tabled in the parliament earlier this week has allotted more funds on headings relevant for climate change and gender sensitivity, according to a comparison of the red book for the current fiscal year and a proposed amount for the next fiscal year. A total of Rs 488 billion is directly or indirectly relevant for climate change adaptation, and this categorization is done as per the budget. There are 11 different indicators to assess the budget relevant for the climate change. Of this, a total of Rs 60 billion will be directly relevant to mitigate the challenges of the climate change, while the indirectly climate change relevant budget stands at Rs 428 billion. This is an increment by 8 percent compared the current fiscal year. Such allocation is only Rs 393 billion—Rs 57 billion directly relevant and Rs 335 billion indirectly relevant—in the current fiscal year. The gender sensitive budget allocation proposed for the next fiscal year is Rs 958 billion—Rs 508 billion directly beneficial and Rs 450 indirectly beneficial to gender issues—which is an increment by 7 percent from Rs 895 billion of the current fiscal year. Such categorization of the budget spending is regarded as a modern way of budget-making, and it indicates that the government has given attention to these sectors though its outcomes have not yet been measured. Some critics, however, are of the view that these are not fully realistic and are taken just for categorization. Any activity that gives 50 percent or more benefits to women are categorized as directly beneficial to women, while activities with 20 to 50 percent benefits are regarded as indirectly gender-sensitive. According to the Secretary for the Ministry of Agriculture, Land Management, and Cooperatives, Gopinath Mainali, there exists a practice, although a bit liberal, to make categorization during budget-making in terms of climate change relevance and gender sensitivity. “This is an example of how the government has given attention in its budget planning--from project selection to budget implementation--in an attempt to go for a very modern way of budget-making,” he said. Mainali was the national focal person while starting this categorization during his stint at the National Planning Commission as a joint secretary. Lawmaker of the National Assembly, Bimala Paudel, who is also a gender analyst, said that the move to categorize budget as gender specific was praiseworthy but more works were needed to see its real outcomes. “We need to change the approach of mere mechanical calculation of gender categorization. Its real outcomes need to be analyzed in detail,” said Paudel, adding that the indicators of categorization should be made by trained people.